Hi Friends: So happy to share my next project as June's guest designer for Little Blue Button Stamps. 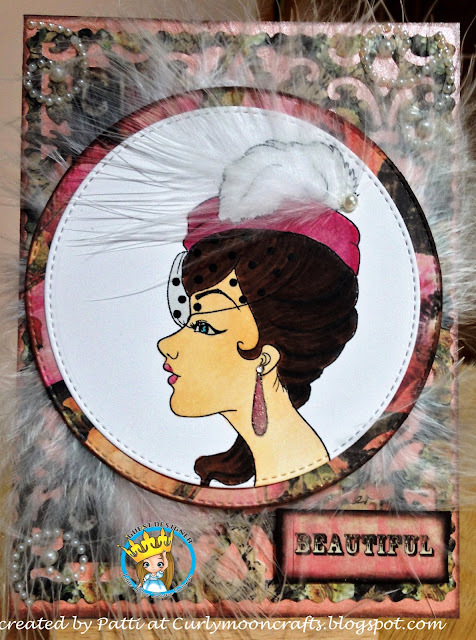 My second project is a card using the gorgeous digi stamp called Mix Media Lady in Hat. As soon as I saw this image, I knew I wanted to work with her and incorporate feathers into my design. I hope that you are inspired by my project and want to try using this lovely Mix Media Lady in Hat digi in your next project! Happy Crafting! Print image onto smooth white cardstock and color with Spectrum Noir markers. Cut image with stitched circle die. Use larger stitched circle die to cut another circle from the patterned paper pack, ink edges, and glue to back of focal image. Cut shimmer paper to fit A2 card base and glue to base. Cut patterned paper panel using the patterned panels die and glue to base. Add focal image to base with craft foam. Cut sentiment from paper pack, ink edges, and add to right corner of card. Add feather over feather image on hat, accent with a single pearl. Add glitter brush pen to eye, lips, and earring. Cover earring with Glossy Accents and ultra-fine glitter, then accent the top with a small gem. Add pearl gems to corner of card, then finish card with feathers tucked under/around the focal circle.